Overview: Marvel’s man of the night is back with Essential Moon Knight Vol. 3. Regardless if the man under the mask is Marc Spector, Steven Grant, or Jake Lockley, Moon Knight is ready to take on any challenge, whether it’s physical, mental or mystical. Sadly, this volume begins with the end of writer Doug Moench’s run on the title. During this run of issues, the Moon Knight titled transitioned into a direct market title, meaning that fans could only find the book at comic book retailers and not on the spinner rack at your local convenience store. The direct market status came with some benefits to the discerning readers. The comics were ad-free, giving us longer stories, and were eventually upgraded to a better paper quality. In addition, Marvel could start to tell somewhat more mature stories in this format. One year after the end of the direct market title, Moon Knight returned to the spinner racks with Moon Knight: Fist of Khonshu. Now Marc Spector must act as an agent on Earth for Khonshu, which puts him at odds with the love of his life, Marlene. She leaves Marc, freeing up Marc (and the writer) to move about without having to check in every issue with a supporting cast. Sadly, the book lasts just six issues before it was cancelled. This collection is rounded out by some solo Moon Knight stories that appeared in other books, such as Marvel Fanfare. Unfortunately, the sporadic nature of these tales makes it hard to have any true character development. You might have to look elsewhere to find a lengthy run with Moon Knight. See below for more details! What makes this Essential? : Visually, these are some great stories. Sometimes you buy books just for the art, and this may be one of those. That said, Moon Knight as a character loses direction with Doug Moench leaving the character. It’s as if no one at Marvel knew what to do next with Moon Knight. I loved the start of the Fist of Khonshu series, where he had to act as a champion for Khonshu or face physical pain. But that series came to an abrupt end. Given the potential we saw with the character during the Moench/Sienkiewicz era, this volume feels like a let down in comparison. If you like this volume, try: West Coast Avengers Omnibus Vol 2 from 2013. Shortly after the cancellation of Moon Knight: Fist of Khonshu series, Moon Knight relocated to California and started hanging out with the West Coast Avengers, beginning with issue #21 of that title. 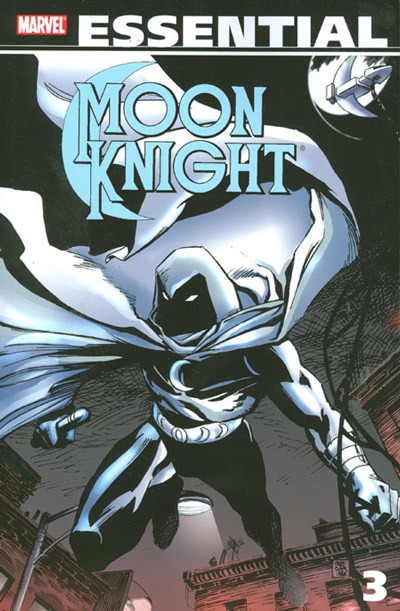 Moon Knight stayed as a member of the team for almost two years, before leaving the team with issue #41. From there, Moon Knight moved back into his own title once again, named Marc Spector: Moon Knight. That ran for five years, but it doesn’t appear to have been collected yet.